"Carnage of Poms" is part of a body print work entitled "Easy Open", and is based on a stack of small brochures from the grocery store which give a simple strategy for consuming these complex seasonal fruits. Pomegranates can elicit a sense of inadequacy and ignorance, as the process involved in acquiring the ruby seeds seems to outweigh their deliciousness. This large scale triptych was created through seven layer woodblock relief printing and illustrates a scene of pomegranate carnage. Due to the sheer scale, the work can be seen as a landscape, a war scene, and a kitchen counter all in one. The rough, tactile mark-making qualities of woodblock relief printing, along with the rich colours and dégradés create a lustre and visual tastiness that translates an ordinary image into an extraordinary scene. 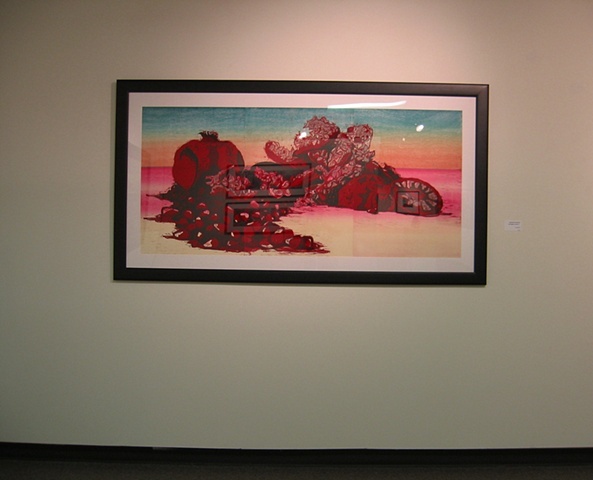 Image of the work installed in "The Latcham Gallery Annual Juried Exhibition", at the Latcham Art Gallery, Stouffville, Ontario (May 2-June 5, 2010).